As a “content consigliere” to busy executives, I not only help develop a lot of thought leadership content — I also consume a good bit of it, too. And I’m sorry to report that much of it lacks two absolutely essential elements: original thought and authentic leadership. Now, please don’t misunderstand me. Many of today’s executives are, of course, extremely original thinkers and suffer no lack of leadership abilities. After all, one can’t stay in the corner office long without a sufficient supply of both. It’s just that top executives are typically too busy to fully participate in creating the kind of content that projects the passion and personality required to convert thought capital into bottom line currency. Yes, a good ghostwriter can help by turning talking points into keyword-rich bylined stories, and those can be quite valuable. But consider what one research study found to be the four essential qualities of an effective thought leader, and you’ll begin to see why relying on ghostwriting alone leaves too much of your best thinking on the table — and why first interviewing on video (as I do with my clients) is your best route to creating more powerful executive content. Firstly, thought leaders have the ability to effectively reach other individuals in their respective organizations and/or industries. Secondly, thought leaders have the capability to engage with their respective audiences through personal communication. Thirdly, thought leaders have the capacity to stand-out as authoritative figures in the organization. This authority stems from the individual’s confidence, expertise, and his/her influential skills. Lastly, thought leaders are willing to weave longevity into the fabric of their ideas (or the ideas they championed). Thought leaders leave an impact that lasts long after the idea has been implemented. Reach other individuals: Your communication must come across with as much one-to-one impact as possible. Engage in personal communication: It’s not just your thoughts that matter, it’s your personality, too. You can’t settle for simply making business sense, when you also need to make a human connection. Stand-out as authoritative: Beyond being well-reasoned, your thinking must come across with authority. And in a world where reason increasingly takes a back seat to emotion in decision-making, people need to see and hear for themselves, in the most first-hand way available, that you exude confidence, expertise and a compelling level of skill. All of the above is much more convincingly communicated if your audience sees it and hears it for themselves. In short, if they see and hear you for themselves. And that’s where video comes in. 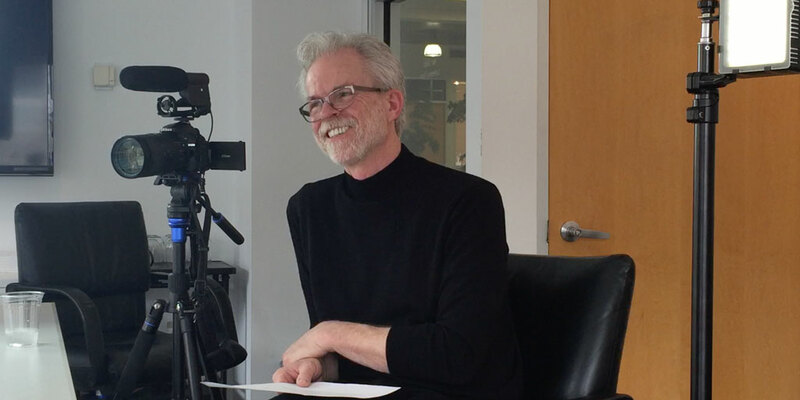 The beauty of interviewing on video — as I first discovered writing and creating videos for Branding Magazine, and which I’ve since employed to great effect for clients — is that it is, hands down, the best way to capture not only the thoughts, but also the thinker. With video you can see a leader’s intensity, feel their passion for a subject, judge for yourself the nimbleness of their mind and even get a sense for the genuineness of their personality. 1. Give your executive interviewee questions in advance, and time to mull them over. Even if the leader in question is familiar with your editorial calendar and knows what the immediate topic is to be covered, you’ll do everyone a favor by submitting a short list of starter questions at least a few days ahead of time. Your interviewee needn’t formulate complete answers in advance — your top people know their stuff well enough that simply having the questions in mind is sufficient prep. In fact, that’s part of the “magic” to interviewing execs on video… they already know their stuff and can talk about it well and at length, without having to invest time (that they’ll never have) in formal preparation. 2. Have a real conversation first; then go back for the sound bites. In a traditional, text-based interview, a “brand journalist,” pen and paper in hand, head buried in note-taking, faces off with the interview subject, pursuing what has as many characteristics of an interrogation as it does of a conversation. But free the interviewer from the relentless responsibility to record what’s said and you can progress from simply gathering information to truly conversing, human-to-human. You can have a real conversation — and when you do, you never know what bit of executive personality will leap out and do its part to bring the larger brand to life. Of course, real conversations ramble. This can provide great, editable fodder for any number of written pieces, and flashes of honest brilliance for video or audio use, but which can also present a problem if you need to edit your mini-series into a 3- to 5-minute video. So, once you’ve concluded your topical explorations, circle back to zero in on four to five of the key questions you’ve just covered, and ask for an answer to each in just one or two sentences. In that way, you’ll end up with a reliable, cover-the-basics edit and still have a shot at serendipitous greatness. 3. Hire a real interviewer if you want real conversation. If you want to draw the best out of your thought leader, find an interviewer who can lead, too. Hire someone with enough experience that they know how to guide a conversation past the predictable, who has enough gravitas that they can hold their own with even the most self-assured CEO, and who is sufficiently independent (i.e., not a staffer) that they can push for honest answers. Once you’ve completed your interview, it’s time to start repurposing, with a passion. First, upload the audio from your session for a transcript (my current go-to service is rev.com, although, given the demand for transcription in a content-hungry world, don’t expect flawless, verbatim text from any source, and check your transcript carefully). Once you have your video and audio in hand, along with the text version, you’re equipped to create videos, podcasts, articles, blog posts… all from one hour or less spent with the thought leader in question. Which brings us to our final, and possibly most counter-intuitive, point: you should begin your executive content creation process on video, even if you don’t intend to edit the video. It’s more time-efficient for your executives, more effective in revealing those executives’ authentic ideas and personalities, and, as covered above, it yields source material for an incredibly broad spectrum of future content. In short, interviewing on video is your most bankable approach for turning executive thought capital into today’s marketing currency — and that’s exactly what we help you do at Lead the Conversation. If you’d like to know more about how we can empower your busy executives to truly stand out as leading thinkers in your industry, please contact me, the Chief Conversation Officer.